There are many reasons why owners of pick-up trucks seek to increase their vehicle’s ride height; commonly, it’s the desire to fit bigger wheels and tyres for a tougher look and a more commanding road presence. There are two main ways to increase ride height on pick-up trucks: fitting a full-suspension lift kit which usually consists of complete replacement suspension parts including dampers, springs, leaf springs etc, or, by fitting a spacer-style lift kit which makes use of the existing suspension components. The former is more suited to those seeking extra off-road capability, the latter is more suitable for boosting the style and stance of the vehicle. Cost is a typical barrier to not wanting to fit a full suspension lift kit and it’s fair to say that spacer-style lift kits have a chequered past. However, when done right, they can drastically alter the aesthetics without compromising on safety or comfort. The SuperPro Easy-Lift Kit is an alternative best suited to the soft-core 4WD owner, who wants a less intrusive, easily reversible, inexpensive, safe & legal option to achieve a little more ground clearance and to retain the “feel” of the O.E suspension with the look of a lifted pick-up. SuperPro has invested a lot of time and resources into making sure each vehicle’s suspension geometry is incorporated into the design of every kit including consideration of the solid height to ensure the shock absorber does not bottom out before it strikes the bump stop. 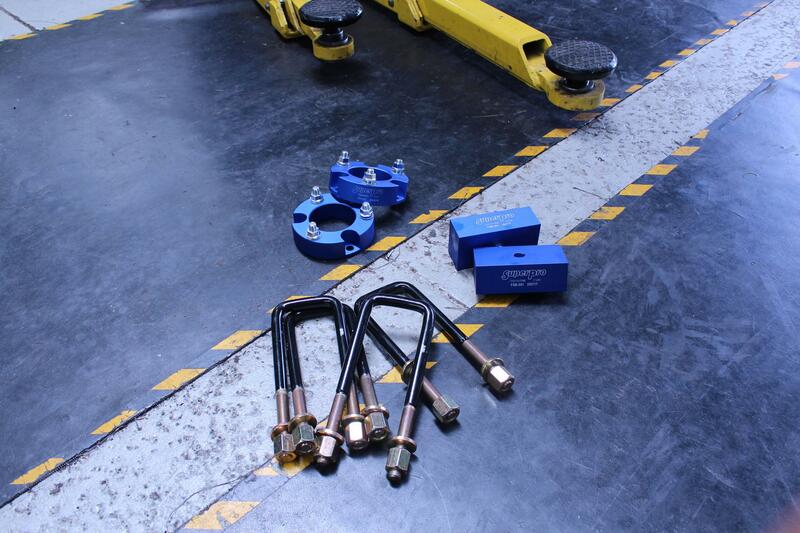 The lift height of each kit is unique to the specific vehicle application and the associated hardware is designed, engineered and thoroughly tested. It’s also important to note that SuperPro’s Easy-Lift Kits raise the front and rear of the vehicle the same amount which maintains O.E. rake and weight distribution to ensure the O.E. braking performance is unaffected. Everything required to fit is supplied in each kit, including comprehensive fitting instructions to ensure the right outcome every time.